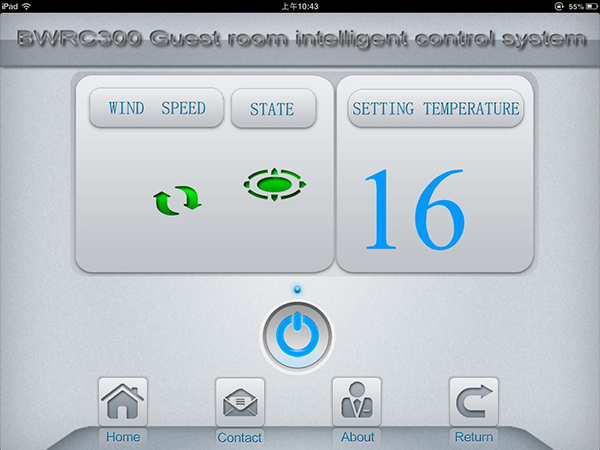 Bonwin hotel room intelligent control system can provide a custom app for hotels that enhances the guest experience while adding another level of service to your property. Our app is not meant to replace personal contact with your guests, but rather supplement it. The APP gives your guests access to vital information about the hotel property before they ever begin their stay. With APP control, guests can begin connecting with hotel's equipment from their smart phone or tablet before they’ve even made their reservations. Guests who have access to information about the hotel from custom mobile app are more likely to extend their stay. Having advance knowledge of special events, restaurants and other special attractions about hotel can help your guests discover additional reasons to not only stay at the hotel, but to plan for a longer trip. Also, guests who are currently on-site and enjoying their stay, can bring up the custom mobile app to quickly and conveniently add additional nights to their current stay. After the trip is over, the custom mobile app remains in guest’s smart phone or tablet. Another souvenir from their trip to the hotel, it can not only remind them of their stay at hotel, but also encourage them to begin planning their return trip. With one click, they can begin exploring current specials and make return reservations from their smart phone or tablet. Mobile APP not only greatly strengthened the hotel room management efforts and improve the efficiency, and may be appropriate to reduce labor costs, providing the most advanced management tools and technology support for the hotel.